These are the ponderings of an nonageneran who chooses to call himself, "The Old Fool"
← Can Divisions be Avoided? A major change is about to take place in my life. When Rhoda and I came to Indiana in 2007, we knew we would get older each day, but we didn’t reckon that Rachel and Eldon would grow older along with us. Now eight years later, Rhoda is gone and I am 89 years old. When I overheard Rachel and Eldon talk of being 65 years old, receiving social security and the eventual need to downsize, I decided it was time for me to get out of their way. We have adjusted well as a family, and the eight years together have been a happy time for us all. But good things come to an end. Eldon is a hospice chaplain and makes frequent visits to the retirement center of Greencroft Goshen, so he make an initial contact on my behalf bringing me a packet of information, and the process began. On Monday afternoon, May 18, 2015, Rachel and I met with Greencroft’s Housing director and we were shown an available apartment. A bathroom supplies a commode, shower, wash basin, and cabinet with mirror. A kitchen offers a micro wave, refrigerator, freezer, drawers shelves, and space for a table. In a living and bedroom with closet there appears to be space enough for my computer desk and computer, a bed, TV, radio and clothes. A sliding glass door opens to a concrete patio and common grass area maintained by Greencroft. If I take a few steps onto the grass I can see the sign of Oak Court where My Joy lives. 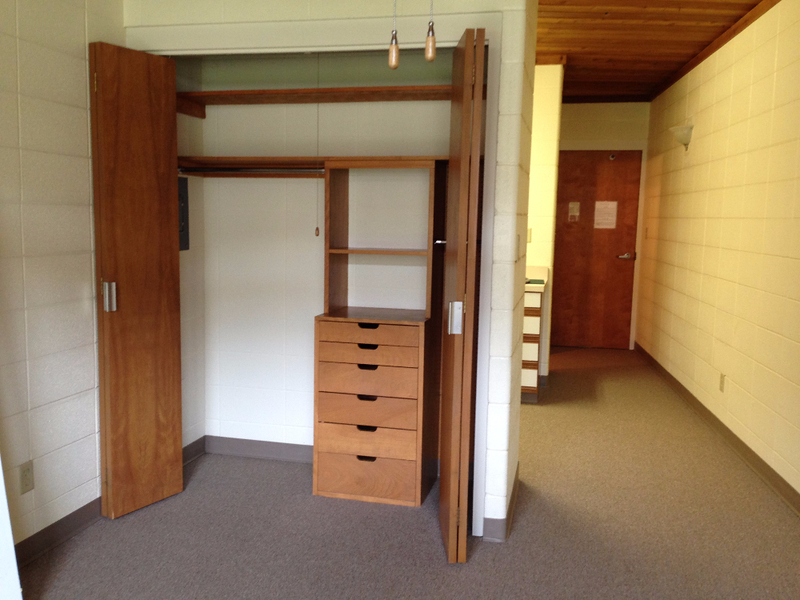 There is a parking space for my car, access to a dining hall, library, aviary, and spaces for lounging The room where our group meets to play games every Friday afternoon will be three doors from my apartment. Attendants are available as needed. What more could an old man need? I blog about my interests, and this pending move will no doubt interest me. So far I have written 456 posts that are all available on this website. The archives on the right are organized month by month and by category. You are invited to click on them for reading if my blogging becomes too sporadic. Or you may read some of the longer pages shown on the black ribbon above. I was born 92 years ago, the son of a Mennonite pastor and organic gardener in Franklin County, Pennsylvania. At age 10 I was baptized as a member of the Marion Mennonite Church. I own the "Old Fool" moniker because I want to walk the Jesus Way even though the world and much of the church takes me as a fool for doing so. In my life I have moved from being a young conservative to an elderly radical. I tell that story in My Faith Journey posted on my website. This entry was posted in Family, Highlights, Uncategorized. Bookmark the permalink. Martin, your new housing almost identical to mine! 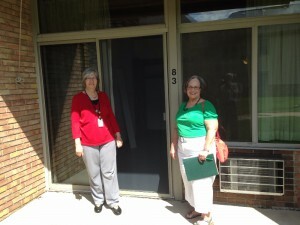 On June the sixth I am moving to the Harrisonburg retirement apartments. (VMRC) I am really looking forward to it, as all three of my married children there—well my oldest daughter and husband and sons live in Richmond, but it is going to be so much closer driving there then driving from Delaware to either place. Of course there is that sadness at leaving my little retirement home where Vernon and I moved for his last two years of life. And also leaving all of my friends here–and my sister, but I have felt Gods leading in this, so I am satisfied. My prayers and good wishes for you, Martin, as you make the change. Welcome to Greencroft, Martin. We are pleased to have you on the campus with us. My parents, A J & Alta, had happy years in the round building. new home. I have enjoyed your blogs and look forward to more! Blessings! It will be good to visit with you. 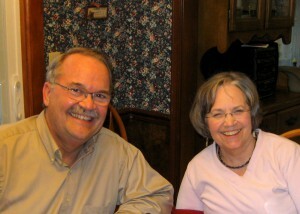 Paul Longenecker and Louise Showalter were here for a visit this morning. I am still with Rachel. The move to Greencroft is scheduled for about the time you plan to be here. Maybe you can help squeeze my furniture into place. or you may Mail a Check.